The state dairy minister also expressed confidence that K Palaniswami's camp would get the 'two leaves' symbol. K T Rajendra Balaji said nobody could destroy the AIADMK now that the party had PM Modi's support. 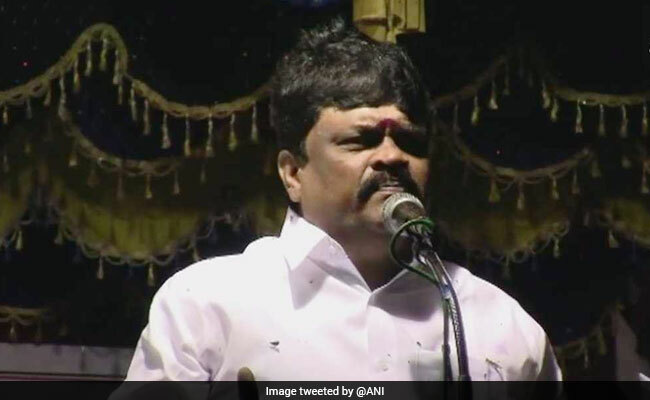 Andipatti: Tamil Nadu Minister K T Rajendra Balaji on Saturday said that nobody could shake the AIADMK as long as Prime Minister Narendra Modi supported the party. "As along as "Prime Minister Narendra Modi is with us, nobody can shake our party, nobody can destroy AIADMK," the minister said while addressing a party meet. The state dairy minister also expressed confidence that Chief Minister K Palaniswami's camp would get the 'two leaves' symbol saying "the symbol will come to EPS camp, there is no doubt about it." He asserted that no one could oppose the ruling AIADMK, including the DMK. He claimed that 92 per cent of general council members supported Mr Palaniswami's camp. The Election Commission had on March 23 frozen the name AIADMK and its election symbol after the factions led by Sasikala and former chief minister O Panneerselvam staked claim to it ahead of the R K Nagar bypoll, necessitated by the death of party supremo J Jayalalithaa. Chief Minister Palaniswami, however, revolted against Sasikala. On August 21, rival AIADMK factions led by Palaniswami and Panneerselvam merged, ending a nearly seven month feud in a power sharing formula in the ruling party and the government in which the latter was made the deputy chief minister. Mr Balaji had earlier courted controversy when he alleged that private dairy firms mixed harmful chemicals in milk.